Turkey is perhaps not the first country that you think of for a steel displacement yacht, but its often sheltered waters and the picturesque little bays and harbours along its more than 6500 km of coastline provide excellent sailing. Since 2014, Linssen’s agent for Turkey has been Gena Yacht. 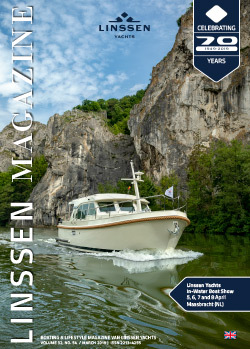 This firm will be representing Linssen Yachts in various places for sales, service, and maintenance. The firm’s head office and technical centre is at Çeşme-Port Alaçatı Marina. It also has offices in Istanbul and at Marmaris Netsel Marina, and a service point in D-Marin Turgutreis. For other Turkish harbours, Gena Yacht has a mobile team available. Turkey has a rich history involving many cultures such as the Hittites, Assyrians, Greeks, Armenians, Persians, Seljuks, and Ottomans. Turkish towns and cities can often trace their history back to before the Turkish period, with very many remains still being visible. The fact that there are still so many intact historical buildings in Turkey is because the Ottomans often carried out restoration work. Major historical towns and cities such as Istanbul, Bursa Edirne, and Izmir are very popular with tourists, but there are hundreds of historical sites throughout the country, for example the many now ruined Greek cities of Troy, Ephesus, Pergamon, Miletus, Priene, Aphrodisias, Sagalassos, Xanthos, Side, Phaselis, and Didyma. Turkey is therefore very much worth admiring from the water.